What is Target Outranking Share Bidding? How Does Target Outranking Share Bidding Work? This guide is a detailed look at Target Outranking Share bidding, if you are unfamiliar with this bidding technique or bidding strategies in general; you may want to read our introduction to bidding strategies first. Target Outranking Share is an automated bid strategy that essentially allows you to outrank ad from a competitor that you specify. There are typically two flavours for most automated bidding strategies, but for this particular strategy you must create a portfolio bid strategy or use an existing one… There is no ‘standard’ version of this bid strategy available. Portfolio bid strategies can be applied to multiple campaigns and they work across all of these campaigns to achieve targets. In the case of ‘Target Outranking Share’, this will apply a target spend across all of the campaigns to which it is applied… meaning that some campaigns may under target and some may be over target, but in total the target should be met (when aggregating across all of the campaigns). The No. of times your ad ranked better than competitor’s ad, plus the number of times your ad showed when theirs did not, divided by the total number of ad auctions you participated in. If you have a competitor that consistently outranks you or is regularly in the top three positions; you may benefit from using this flexible bid strategy. You really do need a specific competitor and a strong reason to use this bidding strategy in order to implement it across any of your campaigns. This strategy does not guarantee that you will outrank a competitor and the end result is not being driven by anything particularly strategic… You can target a search page location using another bid strategy that will help you to achieve a specific location in the SERPS. As the image above shows, there are a number of parameters to explain within this bidding strategy that we describe below. Like all Portfolio bid strategies, Target Outranking Share automates your bids in order to achieve its target, which is defined within the strategy. The benchmark domain is the specific domain of the competitor that you would like to outrank, this is taken form the auction insights report but you can also manually enter any domain if you so wish. Here you can specify the percentage of auctions in which you would like to outrank the specified competitor domain. This can become very costly the higher the percentage specified. 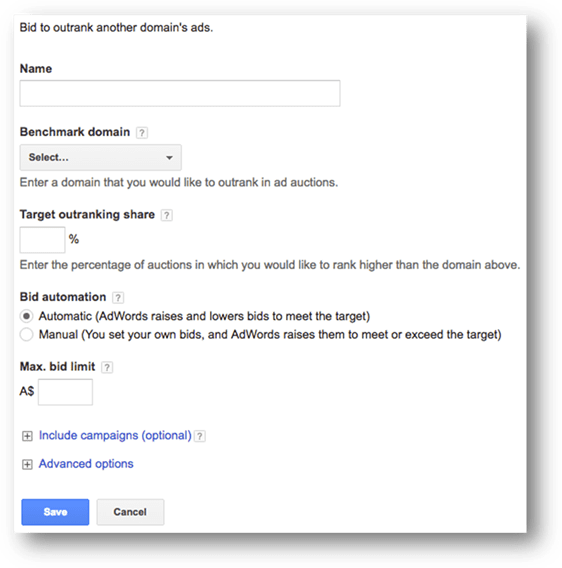 This option allows Google to set and adjust bids in order to outrank the specified competitor’s ads. 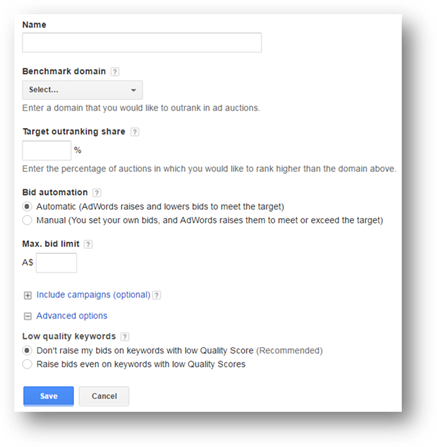 Although this option allows you to set the bids, Google still has control over adjusting them to raise or lower your ad position to beat the specified competitor’s ads.